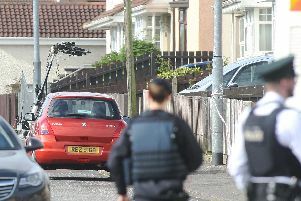 Three men have been arrested in County Donegal in connection with the bomb left under the car of a PSNI officer in Eglinton. Gardai in Donegal this morning (Thursday, June 18, 2015) at approximately 4 a.m. arrested three men near Ballybofey. A Gardai spokesperson said: “A car was stopped by the Northern Regional Support Unit, the vehicle was searched and the men arrested. The car is now subject to a technical examination and searches are ongoing in the vicinity of where the car was stopped.